Carolina Hurricanes defenseman Justin Faulk is on a roll. He has nine points in the past eight games, leads the Hurricanes in scoring for the second straight season, and leads the NHL with 12 power-play goals. The 23-year-old may soon supplant captain Eric Staal as Carolina's most valuable player, if he hasn't done so already. Beyond his scoring (27 points in 34 games this season), Faulk has always been Carolina's top choice on defense, even as a 19-year-old rookie in 2011-12, when he led the Hurricanes in ice time per game. He takes on top opponents, drives possession, and works on the penalty kill and the power play, where this season Faulk has really excelled. Faulk is one of the best weapons in the NHL with the man-advantage. By scoring 12 of Carolina's 20 power-play goals this season, Faulk is on pace for a historic feat. Since individual power-play goals were first recorded in the 1967-68 season, no player has scored 60 percent of his team's power-play goals. In fact, two players, Brett Hull and Pavel Bure, have reached 40 percent of their team's power-play goals. With 20 power-play goals in 34 games, Carolina is on pace for 48. Faulk would need to score seven of the expected 28 goals (25 percent) to become the third player to contribute 40 percent of his team's goals with the man-advantage. Even if Faulk slows down, there are several milestones within reach. With six more power-play goals, he would compete for the Carolina/Hartford record, which is held by Blaine Stoughton, who scored 16 of the Hartford Whalers' 42 power-play goals in the 1979-80 season (38.1 percent). It also would be enough to break the NHL record for a defenseman, set by Adrian Aucoin in 1998-99, when he scored 18 of the Vancouver Canucks' 57 power-play goals (31.6 percent). 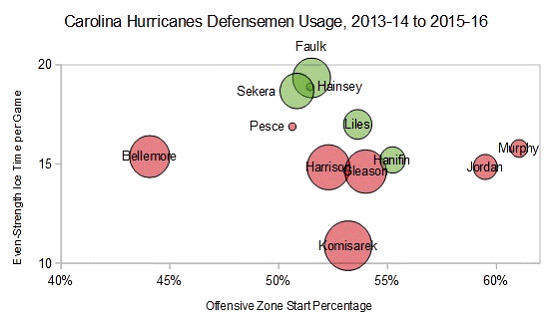 At even strength, Faulk is the Hurricanes' most valuable defenseman. He is a strong player at both ends of the ice and is leading Carolina in average ice time for the fourth time in five seasons. The following modified player usage chart demonstrates Faulk's value, relative to every other defenseman who has played at least 20 games for the Hurricanes over the past three seasons. Faulk is at the top of the chart because he has the highest average even-strength ice time (vertical axis) among their defensemen. Typically, that also means he's the player matched against top opponents. The horizontal axis is each defenseman's offensive zone start percentage, which is the share of faceoffs when a player has lined up in the offensive zone, relative to the defensive zone. Some Hurricanes defensemen (Michal Jordan and Ryan Murphy) have been used primarily in offensive-minded situations. Brett Bellemore, now with Providence in the American Hockey League, was used primarily in a defensive role. Faulk's location in the middle of the chart reflects the fact he is trusted in all game situations. Most importantly, the sized and colored circles around each player's name represents how well Carolina fared in terms of puck possession, measured by SAT Relative Percentage (the percentage of all shot attempts taken while the player was on the ice, relative to when they weren't). Faulk's green circle means the Hurricanes were more likely to have the puck when he was on the ice, and the size of the circle indicates the considerable extent of that advantage. Imagine this picture without Faulk. Andrej Sekera is with the Edmonton Oilers; Ron Hainsey and John-Michael Liles are 34 and 35 years old; and Noah Hanifin is a 19-year-old rookie with 31 games of NHL experience. The Hurricanes have several other promising young players -- Brett Pesce, Jaccob Slavin and Murphy -- but it would take several years for any of them to replace Faulk's contributions. Fortunately for the Hurricanes, Faulk is signed through the 2019-20 season. To put his value in perspective, consider his closest statistical peers as he progresses through his prime: Oliver Ekman-Larsson of the Arizona Coyotes, Alex Pietrangelo of the St. Louis Blues, and Drew Doughty of the Los Angeles Kings. Those are three of the League's most valuable defensemen in all game situations, which is what can realistically be expected of Faulk's near future. With a 13-16-5 record, it's easy to overlook the potential of the Hurricanes, but Faulk is the perfect example of what's going well in Carolina. He's young, is capable of handling big minutes in all zones and manpower situations, and will continue to improve over the next few seasons. In the meantime, his quest for historic power-play success will keep the fans interested while they wait for the turnaround.